With the Speed-Grip 2, Semperit is offering a new high-tech winter tyre for medium- and full-size cars. In comparison to its predecessor model, the new tyre is distinguished by its brake performance on snow and ice, which has improved by approximately 12 per cent. The new Speed-Grip 2 has a high number of high-grip edges, guaranteeing that the tyre bites into the snow. Thanks to a new type of three-phase high-performance compound, the new tyre stays flexible even at very low temperatures and loses none of its traction, thus increasing driving safety considerably. Through the variable design of the centre and the side of the tread of the tyre, the developers succeeded in gaining additional grip for braking and traction. With its straight sipes at right angles to the direction of travel in the centre of the tyre, Semperit Speed-Grip 2 achieves very good brake performance on icy roads. The straight design of the sipes ensures that a water film on ice is quickly channeled away. It is first cut through by the sipes and then channeled away to the sides. “By virtue of its scraping edge technology, the Speed-Grip 2 provides the best possible traction on icy surfaces”, says Heike Schöpper, explaining the new tyre’s high brake performance. With the structure in the tread centre as well as special elevations between the individual blocks, the developers were able to strengthen the support between the individual tread blocks. This has improved the handling characteristics and made the steering response more exact. 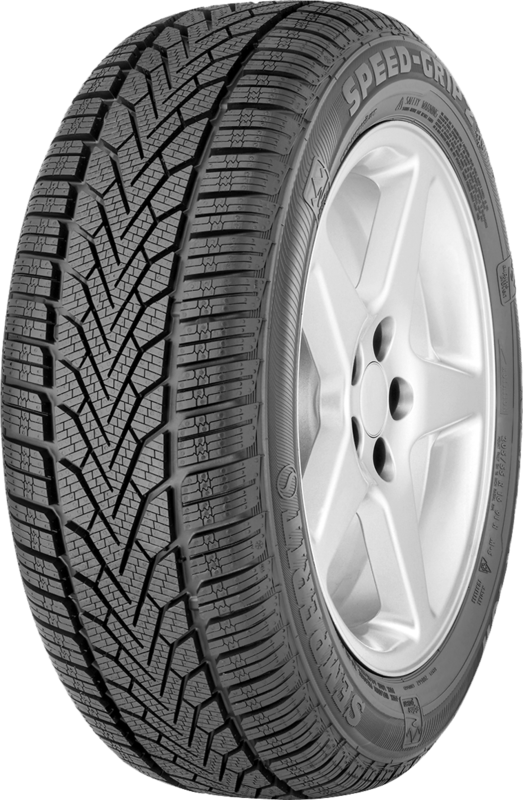 Even when temperatures are warmer in autumn and spring, the Speed-Grip 2 maintains its high tread stiffness thanks to its new three-phase compound. Funnel-shaped cross grooves und two circumferential grooves ensure that water is quickly taken up and channeled away from the contact patch when driving in the rain. In this way the risk of hydroplaning has been considerably reduced. “The new Speed-Grip 2 offers buyers a winter tyre that is suited to the adversities of winter weather and provides a high degree of driving safety and comfort,” Heike Schöpper sums up. Semperit is offering the new winter specialist at the same price level as its tried-and-tested predecessor. Altogether 48 sizes are to be manufactured for rims between 15 and 18 inches. The tyre is approved for speeds between 190 and 240 km/h.